I photographed this family about 10 years ago when the children were young, so it was fun for me to return and do a variety of group poses for them. 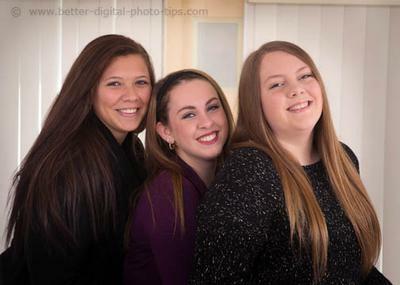 We usually do a variety of group poses and this pose was of the 3 girl cousins. It is a subtle "U" pose. If you connect their heads with an imaginary line the line would be in the shape of a shallow letter U. Women often are not comfortable with having their entire bodies show and this is a good way to focus your photo on their head and shoulders. The colors were planned ahead of time-dark solids minimize our attention toward the clothing. We focus our attention on the faces in a portrait. I found a spot in the house that had a fairly neutral color and few busy distractions. I carry adjustable posing stools in my photo van and they are great for tweaking poses to get them just right. I almost always use a Tripod so that I can watch my subjects as I make the exposures. This is a nice portrait pose for 3 sisters, getting their heads close together. Join in and write your own page! It's easy to do. How? Simply click here to return to Photography Poses of 3 people.